NOTE: Knife or tool not included. 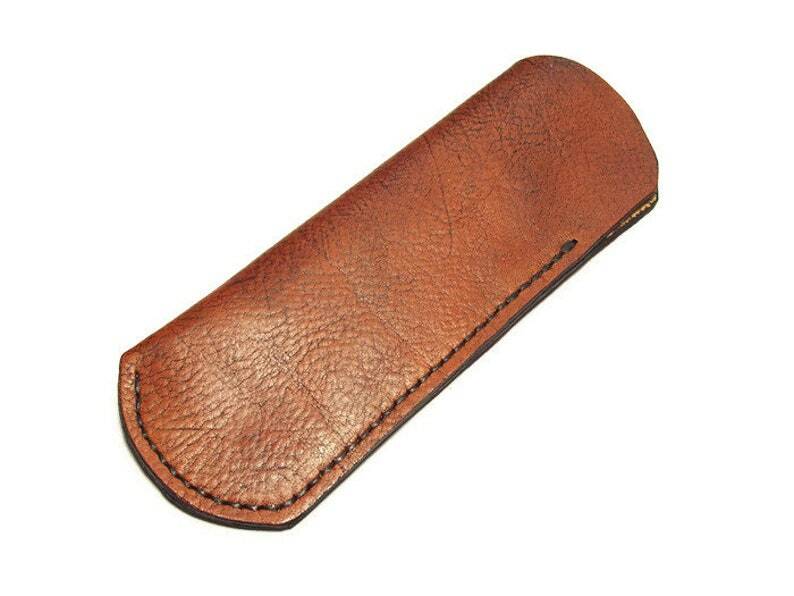 This is a soft tempered leather knife or tool pouch / sheath that will continue to soften as its used. It has been specifically sized for the 110 knife but will work with anything that has the same equal measurements. Can be used for knives, tools, or a variety of items that measure approx. 5 to 5 1/4" Long x 1 1/4" x 5/8" Thick. This item is available in Saddle Tan (shown), Mahogany (shown), Chocolate Brown, or Natural. Inside of sheath is left natural to preserve the softness of the leather. Hand stitched. Stitching is guaranteed for the life of the item. Protect your cherished items with a durable home at a minimal cost. Edges are finished in black. Ships in 7-14 business days (or less). Made in the USA and built to last! After looking at a few of Becky's products on the Site, I contacted her with a question about adding a pocket clip to one of her sheaths. I'd been looking for a convenient way to carry one of my Dad's (RIP) last Buck 110's. She was quick to respond, pointing me in the right direction, and taking part in a conversation about my needs/wants. Needless to say, I ordered immediately. I gotta' say...I couldn't be happier with the sheath. Despite its simplicity, it is quite beautiful, and appears very well made. I had some concerns about it making an already heavy knife much heavier. But, it seems to be the perfect thickness of leather, as it does its job without adding a bunch of bulk and weight. It keeps my Dad's Classic 110 up at the top edge of my pocket. And, as a bonus, it also works perfectly with my 110 LT. I love it. Don’t know how many sheaths CIRKLEBLEATHER has made me over the years. But it’s bunches. Always outstanding craftsmanship that looks great and stands up to daily use. Top of the line work and top of the line customer service.